The biggest swings in the demand for healthcare are often NHS-induced, and this is especially true for clinical support services like radiology and pathology. And yet it’s relatively easy to build clinical support services into your capacity planning, so that they can automatically see (and get ready for) the knock-on effects of whatever the elective specialties are planning. Here’s a simple but powerful example showing how it all works. Let’s start with an elective service that wants to shorten its waiting times: Orthopaedic new outpatients. The blue line shows the projected future waiting time for Orthopaedic new outpatients, which duly ends up hitting the chosen target (in this case, 90 per cent of outpatients to be seen within 6 weeks). That’s better: now they can hit the target in September and hold it there for the rest of the year. This kind of thing is very easy in Gooroo Planner; you just click the green points in the editable profile chart, change their values, and then when the screen refreshes you can immediately see whether it’s had the desired effect on waiting times (and capacity). But outpatients don’t happen in isolation: they have real-world knock-on effects for other services. Gooroo users will already know how easy it is to model the knock-ons for elective inpatient and daycase services, but here we’ll look just at the effect on MRI. In this example, I’ve set up orthopaedics MRI as being downstream of orthopaedics new outpatients. 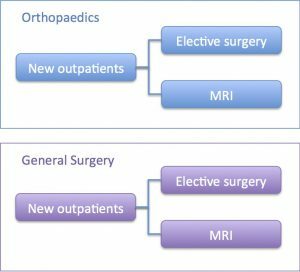 It’s important to set up separate MRI streams for each elective service, so that the different knock-ons from different elective services are captured correctly. Thus General Surgery will get its own downstream MRI service too, like this (and don’t worry: Gooroo Planner will add it all up for you later). Now we’re ready to look at the effect on MRI of our September outpatient surge. In the chart below, the blue line shows the MRI hours per week required to keep up with demand from orthopaedics new outpatients. So there you have it: simple modelling, but with powerful results. Now radiology and other clinical support services can be fully involved in planning for waiting list initiatives and other capacity changes, right down to the week-by-week detail. We didn’t even have to do anything sophisticated, like modelling MRI as a waiting list (though we could have done). And that’s how Gooroo Planner is designed: it’s easy to get meaningful results right from the start, and you can always add greater complexity later on. You can download the dataset used to create this model here: Radiology example.csv When creating the report, the activity scenario was set to achieve targets, and outpatient knock-ons were set to Yes. 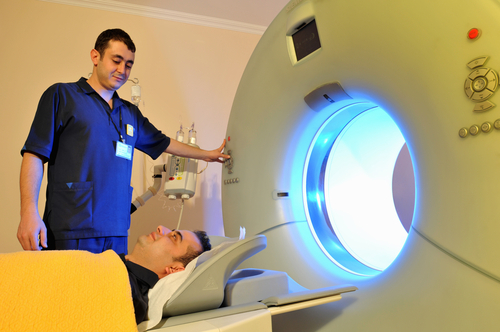 In this dataset MRI was modelled as a non-waiting list service, so that activity keeps up with demand. As a refinement, you will also see that patients who had an MRI have been given their own “6 week” urgency category at the elective stage of treatment, which accounts for the extra time taken to have their diagnostic and the shorter time remaining before reaching 18 weeks RTT; doing it this way removes the need to split the pathway into with-MRI and without-MRI streams with different elective waiting time targets.